July 5th, 2017: Article updated to reflect small updates to the generator line. Ever heard someone say “They don’t make ’em like they used to?” Well, Predator seems to be the exception. Manufactured and sold by Harbour Freight, Their line of generators is built on a platform that has been in use for many years. Speaking strictly in terms of power vs price, this is the best deal out there. But there are some situations where a modern design would be better. 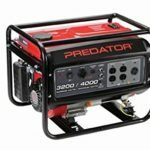 These generators are large, extremely durable, and crank out tons of power. It’s using an engine that has been around for a very long time, making repairs quick and cheap. 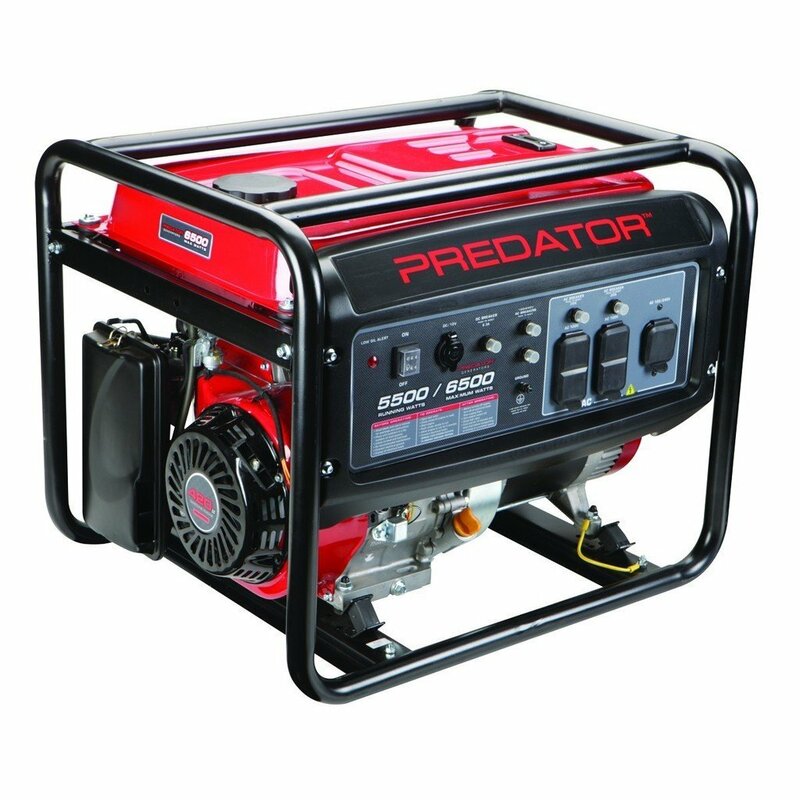 Predator generators are used primarily by people who need something stationary. If you’re looking for a portable option, there are better options out there. But if you’re a contractor running your power tools, setting up an emergency backup system, or simply charging up the batteries in your RV, this could be a good choice. Before we get into specifics, it’s important to understand that generator performance is highly circumstantial. Every single time you see a power rating on a generator, imagine that there is a big fat asterisk next to it. It will will produce the power it’s rated for, but only under certain conditions. with this in mind, the ratings should be more of a suggestion. We’re going to find out what situations the generator performs best in, so you can see if it’s suitable for your needs. Instead of a plastic enclosure, the guts of this generator are mounted inside of a large steel frame. On the right you’ll see the famous Chonda engine. If you’re into motors, you can read about it’s history on Wikipedia. Although it’s fallen out of popularity in favor of cheaper, weaker, and more fuel efficient engines, this is still one of the most popular small engines. You’ll find it in lawnmowers, 4 wheelers, and even go-karts. They aren’t as reliable as a modern Honda engine, but if something breaks then it will be easy to fix. Every small engine mechanic will be familiar with these motors. They’re popular enough that, even if it was the only motor he knew, he’d still stay in business. There are three different options available. Although the hardware is similar, the gearing and electrical system are suited for different purposes. This thing is pretty heavy, the built in wheels are essential. It’s a two-wheeled design, you need to lift the generator up off the ground and drag the back. Considering how heavy the generator is when lifting it directly, we were surprised at how easy it is to lift with the wheels installed. The large handle plays a role in this. Depending on which model you’ve got, you’ll have either five or six outlets. All models have four 120V outlets. They are fused to handle up to 20 amps per outlet. You can easily identify this on generators, because there is that extra hole perpendicular to the large prong. They do this because most household breakers are fused at 15A, so plugging in a 20A appliance would immediately blow a fuse. It’s unlikely that you have anything in your home that requires 20A, but this will be a popular feature for construction workers. One important consideration with these high output outlets is that you need to use an extension cord that is appropriate for high current. if you’re just running a lamp or charging your phone, this is unnecessary. But for tools, it’s worthwhile to check out our guide on extention cord selection. That oddly shaped plug on the right is the 120V / 240V switchable outlet. This is not the typical 240V outlet you’d use for a clothes dryer or an oven, but there are adapters available. This is a GFCI outlet, commonly used for tools. On the left, you’ll find the breakers. If you ever blow a breaker, the reset button is easy to access. There is also a ground knob that you’ll want to connect to your household ground if you’re wiring up your panel. Finally, you’re given a 12V outlet, a power switch, and an on indicator. For the most part, these are all the controls you’ll need for the generator. The last few things you’ll need to be aware of are on the right. Next to the cooling fan for the engine you’ll find a small quarter turn switch on the fuel line. This shuts off the fuel supply. You’ll want to remember its location when you’re planning on letting the generator sit for a long period of time. This switch prevents you from having to clean the carburetor regularly, so it’s a good idea to use it. The panel to the left of that houses the carburetor. If you ever need to do any maintenance on it, you’ll just need to open one quick lever to access it. Finally, the fuel tank is stored on top. 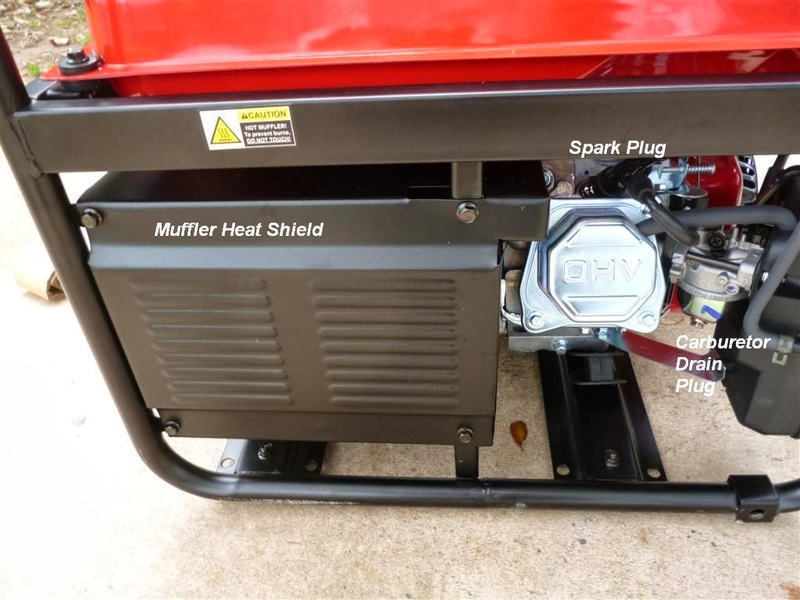 This is very common on inexpensive generators, and can actually save you money in the long run. Not only is it easy to top up, but there is no fuel pump needed since it’s gravity fed. This is one less thing to break, and one of the thing we look for in a reliable generator. We were extremely impressed with the build quality. The entire thing feels solid, and there are several little details we liked. Most of the components are welded together, and when bolts are used they were always over rated for the application. This means that the generator doesn’t wobble around when it’s running – something that can prevent parts from loosening or breaking down over time. Our only complaint would be the quality of the wheels. They aren’t bad, but rubber ones that can go upstairs would be nice. If you’re moving the generator a long distance, it would probably be better to grab somebody to help you carry it. Getting your predator generator running is straightforward. You’ll first have to flip the on switch, then apply the choke by turning the lever all the way to the left. After pulling the ripcord, the generator should start almost immediately. At this point, you can throw off the choke and you should hear it rev up. This startup procedure is common for almost all generators, but what they don’t have in common is how easy they are to use. The carburetor in this generator is a little larger than what’s used in some, so it almost always starts on the first pull. Other generators need a bit of time to warm up before they can handle their rated capacity. But predator models are a little over built. On paper, they could handle more current than they’re rated for. But by reducing the rating, they’re able to ensure that the generator is able to be used almost immediately. The only exception is for those of you that live in very cold climates. Below -20 degrees Celsius, you will want to give the generator a chance to warm up. But you can get around this by storing it in a heated area. The maintenance required by these generators is a bit of a hot topic. 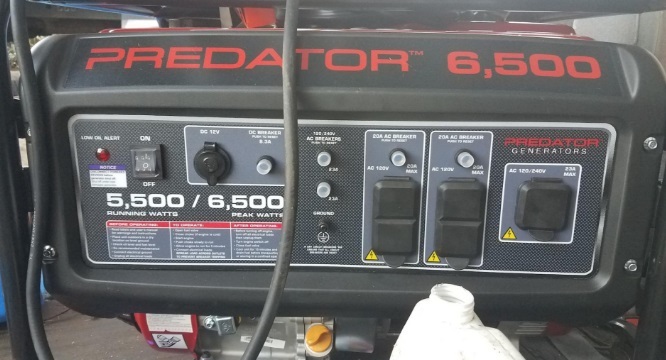 Some users feel that they’re getting ripped when they learn that they can’t just throw this generator in a garage with a full tank of gas and have it ready to go when needed. But the truth is, almost all generators require the same maintenance. The problem isn’t the generators themselves, it’s the gas. When left sitting, all gas goes bad and eventually won’t fire an engine. Now, there are two ways that generators can be built to prevent this issue. You can have a return line from the carb back to the gas tank so that the carb is always empty, or you can put an isolation on the gas line. While return lines are fool proof, the problem is that your carb will always be empty when you go to start it, so you’ll need to pull the engine several times before it can get fired up. One of the things we noticed in our predator generator reviews was that none of the models include a return line. So it will always start on the first pull, but you’ll want to make sure that there is no bad gas in the fuel lines or the carb. If you’re putting it away from a long time, you’ll want to run it for a bit, then turn it off by closing the valve on the fuel line. This only take a minute, and ensures that the carb is completely empty. 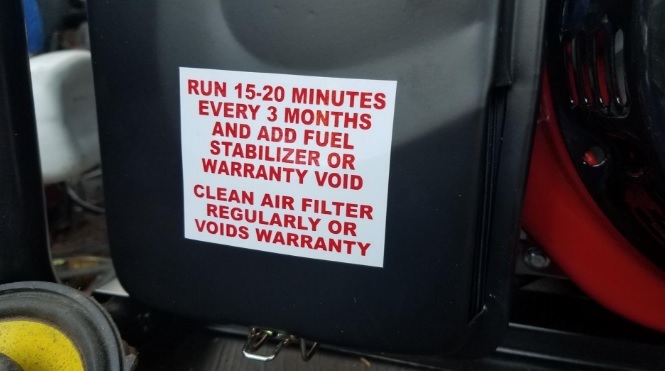 To keep it running, you should start it at least once every three months, or add some fuel stabilizer on the same timeline. Ideally, just store it without any fuel in the system if you’re not going to use it for more than three months. The same goes for your jerry cans. Putting bad gas into a dry generator is just as bad as leaving gas in there for extended periods of time. Our tests covered all three different models. While all of them (for the most part) have the same number of outlets, we’ll have to review them separately. These individual reviews we’ll be looking specifically about the things that are different between then, namely the electrical capacity. Before we get into the nitty gritty, you’ll first need to understand the difference between peak watts and running watts. Running watts is the total amount of power the generator can always produce. Even if you are at full capacity, it can keep chugging along while putting out a consistent 5500 (or whatever the rating) watts until you run out of gas. The peak rating is the maximum power the generator can put out under any given circumstance. This is important for a few reasons. Let’s say that you hook up a fridge, a heater, and a stove to the generator. Each of these devices will pull a large amount of electricity to start, then slowly drop down to their rated use. For these types of devices, you should use the peak rating. But for most, you’ll want to use the running watts as that is much more accurate. 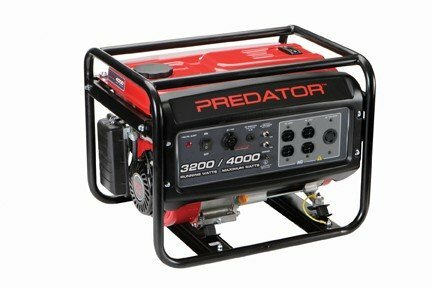 These predator generators are the most popular of the bunch. They’re not the most powerful, and they’re not the weakest. But for most people’s purposes, they’ll do more than enough. This particular model gives you four 120V electrical outlets which are each fused at 15 amps. It can also power the 240V outlet at 30 amps. The total amount of running current that this generator can put out at any given time is 45 amps at 120V or 22.5 amps at 240V. Peak current can reach 54 amps and 27.5 amps respectively. So even though each 120V appliance can use a maximum of 15A, you can’t necessarily use four 15A appliances at the same time. What does this mean for you? The generator can obviously be used for all of the low power appliances you have. You can charge your phones, run your television, charge your laptops, and other small electronics. But you can also use some larger appliances. It will happily run a full-size fridge or a freezer, or even a stove if that’s the only item on your circuit. If you’re using this for a camping trip or to run power tools, it’s more than acceptable. But if you want to wire it into your panel and use every appliance in your home as usual, it might be a little under powered. It’s worth noting that the 240V connector on these is not the same one you’ll find on your wall. These are smaller locking connectors used specifically for generators to prevent them from falling out, and to prevent you from accidentally plugging in a 120V appliance. If you want to run something that requires 240V, you’ll need an adapter. 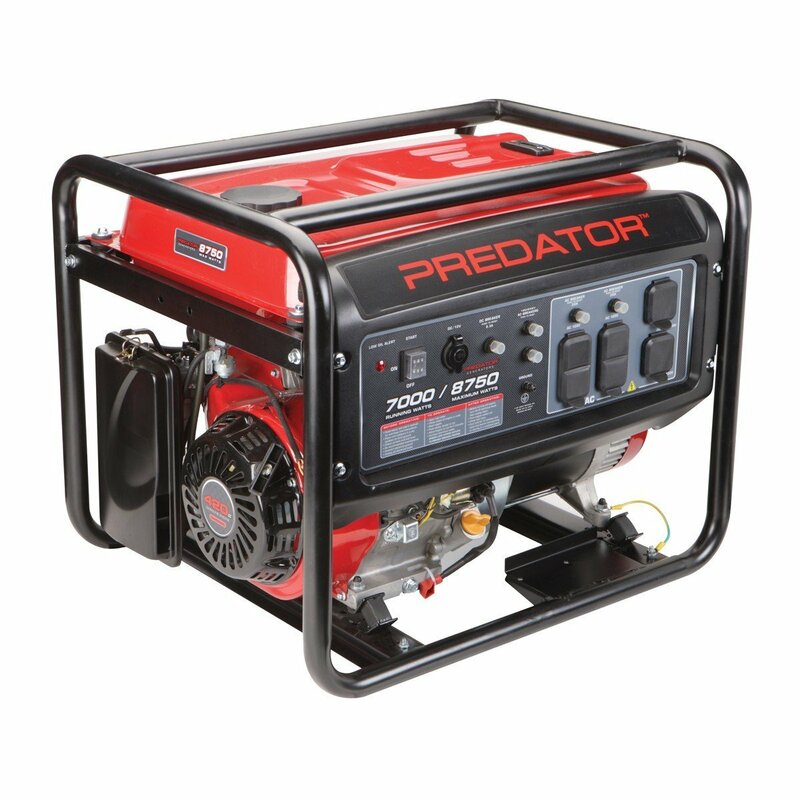 These predator generators are the smallest of the bunch, but still much more powerful than your typical bargain basement generators. Like the previous predator generator we looked at, this one can supply four 120V appliances at 15A or one 240V appliances at 30A. The total current output can reach 26A at 120V or 13A at 240V. this is the largest of the bunch, and capable of producing an incredible amount of power. This generator supplies you with two separate 240V plugs, a clear indication of how much power is available. From running alone, it’s capable of a whopping 60A running current at 120V and 30A at 240V. Considering how powerful these generators are, they’re available for a surprisingly low price. 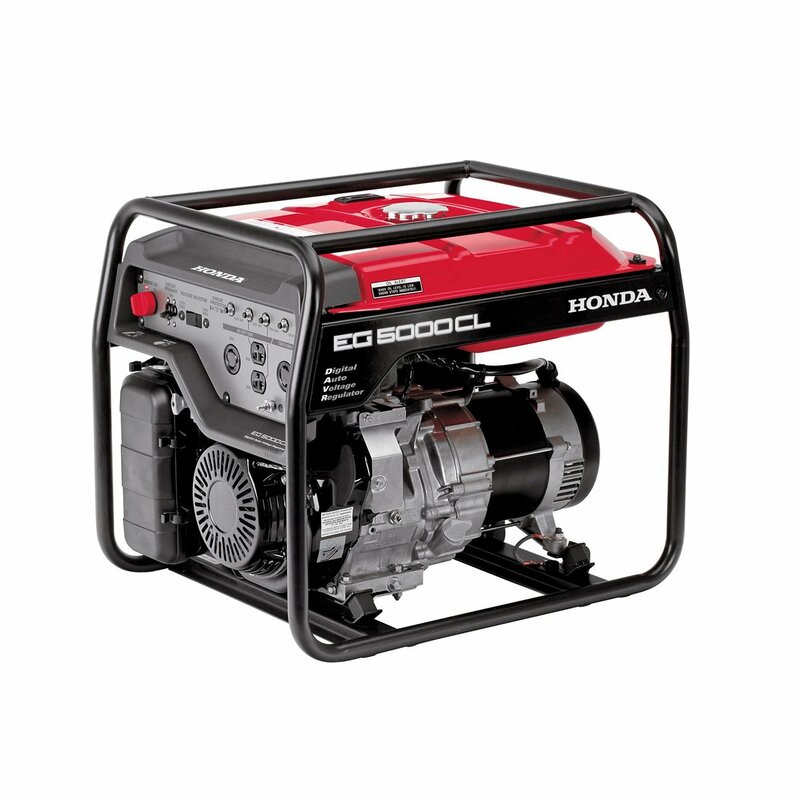 Anyone who wants to run the generators 24 hours a day, seven days a week for an off-grid application might want to something with proven reliability, such as the Honda EU Series. But anyone who is an occasional user will find incredible value in these models.